Beware… These little cakes are addictive. I have been making them for about a year and my friends that have tried them are addicted too. Check out the recipe. Thanks, they are super yummy! I have a question before I give the recipe a go. How does the cake part stay red if it's getting mixed in with a cream cheese frosting? Just want to understand before I charge forward. The cream cheese frosting just mixes in and absorbs into the cake and the color stays red or whatever color cake you are making. for some reason the link isn't pulling up the recipe. any suggestions? thanks! I also only melt a few pieces of chocolate bark at a time because it starts to cool and thicken. It's easier to work with when it's hot. I tried to do the cake balls with while chocolate as pictured on your blog (well, I used a white cake mix, white frosting and coconut), but anyways, I couldn't get the white chocolate to melt to go on smoothly. What chocolate did you use? How did you dip them? I ended up putting the melted white chocolate in a bag and doing squiggles on the top, but I don't like the way it looks. I would love any tips you might have for me! Thanks so much. My garden club just put on our first annual hat and tea party, and I'm looking for items to thrill for next year. This fits that requirement! I've just put your blog on Must Reads & Keep Up. I have to practice like you, but tips would help. Would you send me what you did megs? It might save me some time! I tried these over the weekend with cherry cake and white chocolate, but the chocolate did not go on nicely. It was awful. What is your trick to getting the chocolate to go on nicely? Is it possible that my cake balls were not cooled enough? And read the comments, you might get some help there. With Foot in Mouth.....ME - To get the chocolate on smooth, I dip a chilled ball, one at a time in a bowl of melted candy coating. Then, once covered, I remove it with a spoon and tap it on the side of the bowl so the excess chocolate falls off into the bowl. Then, I let the covered ball slide off the bowl onto the wax covered cookie sheet to set. I have made these for several years and have found the following tips helpful: After baking and cooling the cake, break into pieces and put in a gallon sized ziploc baggie along with the frosting and "squish" until well mixed. Chill for a few hours before rolling into balls. Once balls are rolled, place in freezer and leave overnight. This makes them much easier to dip without breaking and it also helps if you don't make the balls too big. Keep them about the size of a large marble. After they're frozen, dip into almond bark but only use about 1/4 of the batch of balls at a time while the rest are still in the freezer. This ensures that the balls are nice and hard when you stab them with a tooth pick and dip them...they won't break on you. I leave the toothpicks in while they dry and then gently twist to remove and re-dip just the tops to make them look perfect. Hope this helps!! I made these recently and used strawberry frosting (that's what I had on hand) and today I made them with the cream cheese frosting. I think I liked the strawberry better! It was just a 'hint' of strawberry, not overpowering at all. I would suggest giving it a try to those who are trying this recipe. Hi, just wondering if you could tell me how to melt the white chocolate correctly.. Burns easily. Using Toll House White Chocolate chips. What am I diong wrong? Hi, just wondering if you could tell me how to melt white chocolate correctly. Using Toll House White chocolate chips. Burns easily. What am I doing wrong? I have found that using the almond bark works much better than white chocolate chips. Microwave a half pound of almond bark on high for about 30 seconds. Stir and microwave for another 15 seconds. Continue stirring and warming at 15second intervals until smooth. When it starts to get too thick, warm it back up. NOTE: NEVER ever add water or even let a drop of water get into your chocolate! Good luck!! leebojenks - TammyA is absolutely right. They are also called candy melts, wafers or discs and can be found at Hobby Lobby or Michaels. If you have a Kroger around you, they carry white candy coating or "bark"
They are very moist when you roll them. Definitely not dry. You can always use less frosting. You want the balls to be just moist enough to hold their shape. And, I think they are best the second or third day. I've been drooling over the box of sweets ever since i saw these featured on cake wrecks sunday sweets! I work for godiva and do a lot of our dipping work and thought i'd share some help on melting chocolate. Its ALWAYS about the temperature! Heat a little bit at a time when working with a microwave and stir frequently. When working with a double boiler on the stove, constant attention and maintaining the right heat is essential. I keep my chocolate at around 83 degrees. Simply immerse the cake ball in the chocolate, push it a bit around to make sure its cover and pull it out with the utensil (i think of it like dipping easter eggs, only more tasty). Its easy to tap or shake off the excess chocolate this way (and leaves less of a puddle on your wax paper). Hope this helps some! I can't wait to try these out! Will poured fondant work just as good as melted chocolate? I think it would work. It would just have a different taste. I am so very new at this, blogging, working with this type of website, but here goes. Does it make any difference what type of candy you dip in, because mine seems to be too thick and part of the "cake crumbs" mix in with the candy and that is just too gross. Nannie13 - use candy coating, bark or candy melts. Make sure the coating is thin and fluid. You can add a tiny amount of shortening if you need to. Also make sure the cake balls are firm/chilled and not room temp when you dip. Bakerella, I'm just in love with all this different "balls"...But I still have some questions. 1.Where the cake balls & oreo truffles should be store at? and for how long are they still good? 2. Can the chocolates barks and candy melts (after dipping)balls can be at room temperature? does it melts? What other frosting can be used to mix the cake crumbs together other than cream cheese frosting? The sky's the limit, Toyin! Chocolate cake is great with chocolate frosting and dipped in regular chocolate (not white). They taste like truffles! Also good with chocolate cake is german chocolate frosting. I like to use the cream cheese frosting with most other cake flavors (strawberry & lemon are really pretty at Easter when the white dipping chocolate is tinted with a drop or two of pink or yellow food coloring) but you could certainly use strawberry or plain white frosting if you absolutely don't want the cream cheese. Although, once it's mixed in, you don't TASTE cream cheese...it's just very moist and rich. what did you use for the white coating? 1) 1/3 can of frosting was perfect. I broke up the cooled cake, gave it a whirl in my KitchenAid, then added the frosting and let the mixer do the work. The finished product had the consistency of peanut butter cookie dough. 2) The hardest part is dipping them in the coating, but a chilled ball is firm enough to hold up without crumbling - it's really not even "hard," more time-consuming and messy. But worth it! I can't wait to try other combinations! I'd like to make little cake bites covered with cream cheese icing. Ever tried covering the balls in something other than the chocolate or bark? I'd like to know how you store them once you make them - Should you refrigerate or leave them at room temperature - How long do they keep? what is the best way to store them once they are iced? What do you mean when you sau to use chocolate bark? im from london and have never heard that before.... Is it just a bar of chocolate? I just made these for Christmas Eve and they are absolutely delicious. The family LOVED them! I'm going to experiment with this idea and try different combinations. Next time I'm gonna try chocolate cake, vanilla icing and peanut butter coating! oh my goodness! how delish!?!?! Congradulations on your website!!! Everything looks wonderful!!! i want to make these cake balls (and the oreo ones, and so on.... ;)), but before making them, i'd like to know this trikky thing about chocolate melting over the cake balls...On all of your pictures, the balls look great, but i think that when i'll try to make them, the chocolate will not be in full circle with the cake ball...Is there any way to make it a full circle?? Also, bark is a simple chocolate?? How do store the cake balls once theyre done? Do they need to be refrigerated or will they melt in th car? these look great i going to make them this weekend! Successfully made choc cakepops, but tried to make pink bunnies with candy melts. Not so good. The candy wasn't that runny so couldn't dip the pops. I know I can add 'shortening', but what is that? I'm in the UK so not sure what to use, tried margarine, but that just made it set! would I use oil like a choc fountain or trex?! Please help as my bunny ears are now falling off! I've been making cake balls for about 2 months now and mine NEVER come out nice and smooth like yours do. I have a chocolate melting pot, chocolate dipping tools and have used almond bark and Wilton Candy Melts nad mine still I rarely get a smooth one. I freeze the cake balls before dipping. What am I not doing right? I forgot to mention that after the balls have firmed up and I pick them up the bottom has a little spot that isn't covered with coating and the exposed cake 'sweats". What else am I doing wrong? can i use the ghirardelli white baking choco chips instead of the candy melt? Ness, in the US, shortening is often just called Crisco. It's a vegetable shortening that is used in things from making icing to using as grease while cooking. I've not tried this, but I have heard that you can also put a small amount of vegetable oil in bark to make it a little thinner. Hope this helps! And I hope your bunnies' ears stay on! 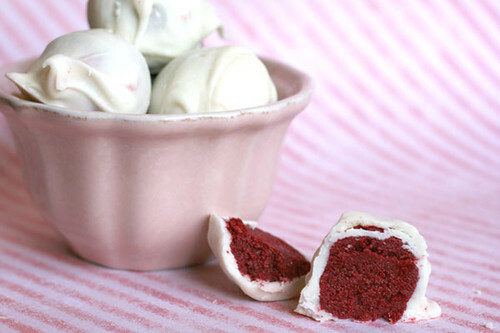 Any tips to not get the white chocolate to turn pink when making red velvet cake balls? Thanks! Could someone tell me how candy flavored oils work with the vanilla flavored colored candy melts? I have tried Wilton brand (ALL I can find around here and I would rather not order online) & didn't care for the taste. Do the oils mask the original taste? Which flavors would work best? And do you think homemade lemon curd would work in the place of frosting to bind the cake? I would appreciate any suggestions and input! What holiday flavor combinations have you tried? Probably the best recipe I have seen in a long time...every time I make them, they are such a hit! I wish I could take full credit for them!! They are delicious!!! This is probably the best recipe I've seen...ever. Every time I make them, they are a HUGE hit...everyoneee loves them..people that don't even like chocolate like them! I wish I could take all of the credit..they really are amazing! Just a hint for melting chocolate...I place a heating pad in a large bowl on high setting. Then place a smaller bowl on top of the heating pad. Pur the chocolate in at about 1/2 cup to 1 cup at a time. This melts the chocolate quicker than you think and keeps it warm while you dip into it. I have been loving your site since I found it! My husband absolutely adores Red Velvet cake, so I make it for him whenever I can... Recently, however, I've gotten a little creative--he's also an Elvis fan, so I made him some Blue Suede cake balls this week and they were a huge hit! Good for the holidays too, because I covered them with vanilla almond bark (I'll use white chocolate next time) and topped them with blue sprinkles--they look like little snowballs!! I make these with oreo cookies. Just take a pkg of oreo cookies and crush them very fine. I use a blender and then mix with your cream cheese. Roll in balls. Dip in almond bark. Very delicious. I call them Oreo Balls. Grandma, do you mix them with regular Philadelphia cream cheese or with a can of cream cheese frosting? I actually Have a question, do you pour the white chocolate over the ball? Because it seems that if you try to dip them in white chocolate the red food coloring from the cake mix will bleed into the white chocolate. True or false? Is there an easier way to make them less sticky? I tried this before and it didn't look anything like the ones on the site. Also what dipping tools did you use? You use regular cream cheese with the crushed Oreos. Ive been reading about these cake balls & cake pops for a while now & im looking at trying it myself but i dont understand what "candy coating" is. I live in England & have no idea what that is or where to get it. Would regular melted chocolate work?! You can buy Wilton Candy Melts on line through Amazon, or other online cake shops. Most supermarkets sell 'coatings' as well if you look in their bakery section, but usually only in white, milk or plain choc. The melts aren't choc so no flavour but great colours. I use normal Belgian chocolate and temper it, but on cake pops you can get away with not tempering it. Best when pops are cold from fridge or freezer. About how many cake balls/pops does 1 cake mix make if the balls are about 1 1/2 inches in diameter? So I am signed up for your Bakerella emails. And I just LOVE everything that you do. I am no good at the decorating part but I sure do love to try. I find that melting the chocolate in a small crock pot works great! Just turn it on to melt the chocolate, and turn it off once it is nice and melted. If it starts to get thick, just turn it on again until you get it to the right consistency. A trick I have found very useful to making your cake balls look great is to use mini cupcake liners and after dipping the cake ball in chocolate with a toothpick, placing it directly into the liner while wet. This is much less messy than having them oozing out on wax paper and they look so cute. when you pull the toothpick out of the top simply dip it into the melted chocolate and smear some over where the hole is! I am a DIY bride and want to make cake pops for my guests. Could you help me out with some tips? I am doing to be doing different flavor combos and decorating them in different ways. I know how to get the cake balls in a nice circle, but how do you get the coating to be so smooth and rounded? How long do they last? (how early before my wedding can I start as I need to make quite a bit) and can they be stored at room temperature? (I will be needing to transport them - my venue is 30 minutes from my house --- will they be okay with jut the car a/c? and will they be okay to set out on the tables without melting too? Sorry so many questions. Can you email me at kristina1059@hotmail.com with the answers and any tips? I would greatly greatly appreciate it!!! Thanks so much for your posts. I too have made these, and when I took the balls out of the freezer and dipped them almost right away, the chocolate coating cracked. I think it was from the temp change. The ones that I left out a while (or just kept in the fridge) worked better. I do have a question if it is okay to use chocolate frosting instead of cream cheese frosting? I am making those cake balls for my daughter 11th bday by the end of this month. Red Velvet Cake is one of mine and my sister's favorites. It's also popular with my boyfriend's family. His oldest brother and his sister like it. I have a feeling this recipe will be hit on their birthdays. These do look very good, I will have to make them!! I am also a DIY bride getting married in September. I want to use a silicon mold to make an oval or rectangle shape and then decorate them as brides and grooms. How early can I make them? Can I freeze them after they have decorated? I plan to make red velvet with white candy coating and chocolate with milk chocolate coating. I would like to keep the red velvet from make the candy coating pink. Any tips would be helpful and appreciated. Thank you! If you prefer to email me rather than post, my email is funstuf2@gmail.com. Thanks! If you have a problem accessing the photo, just post again and I'll email it to you directly. Also, to answer your question about keeping the white chocolate from turning pink...this just takes some practice and for me, dipping a firmly frozen ball. I did read that for some, the frozen balls cracked after dipping but I haven't had that problem. Don't make your balls too big, either. I usually make mine about the size of a walnut. They dip easier that way and may be good for you to try as a beginner. Personally, I like the ratio of cake to chocolate better when they're smaller, too. You might want to try it a couple of times before you are actually making them for your wedding to perfect your own technique and see what works best for you. Good luck!! Thank you for the tips, Tammy! I appreciate it! Ok so I made the red velvet cake balls dipped into white chocolate, but I had a problem with the red velvet making the white chocolate a pink color. I even froze the balls overnight so they would be easier to work with any suggestions??? Hobbs and Lala...don't be too hard on yourself. The balls do take practice and patience before you can expect to have red balls inside of white chocolate (and not PINK). lol. That is the Wilton brand but they have others also on Amazon or in somewhere like Michael's or Hobby Lobby. How to know if they're firm enough. Again, trial and error. If you dip one and have a hard time getting it out of the chocolate without it breaking, then leave it in the freezer a little longer. And be sure not to make your balls too big. They're so much harder to handle when they're bigger. Once you get the hang of it, you can adjust that to your liking but starting out, I would make them about the size of a large marble. Also, don't melt all of your white chocolate at once. That way, if your chocolate starts getting pink, you can dump that and start with some fresh. BAKERELLA: You are my hero!! I absolutely LOVE your website and all of your beautiful goodies. You are such an inspiration!! i've been making oreo balls for a couple of years now and they were a big hit but these definitely won over! Yesterday I made your delicious red velvet cake balls, along with oreo cake balls. To say they were awesome would be an understatement. More oohs and aahs from relatives that I ever received before and I love to cook. However I while everyone says how easy they are to make on your website, I had so much trouble. I made the red velvet cake mix- No problem. I bought three kinds of chocolate. Nestles Toll House semi sweet chocolate bar, Ghiardellis semi sweet chocolate bar and Nestles white chocolate chips. First I TRIED to melt the Ghiardellis and followed the instructions in the microwave at 50 percent power level for a minute and then 10 second intervals. All of a sudden there was smoke coming out of my microwave and the chocolate burnt. Okay, so I now followed other directions with the Nestles semi sweet bar and melted it at 100% power for 45 seconds and had to do it maybe once or twice more for 10 seconds. It melted okay, not quite as thin as I thought and there was my problem. I had frozen the cake balls for an hour and when I stuck a toothpick in them and dipped them in this chocolate, they just fell apart when lifting them out of the thick chocolate. WHAT A MESS!!!! So I added maybe a 1/4 of a teaspoon of oil, but when I took the balls out of the chocolate they always had the hole in them from the place where I tried to take the toothpick out. It was horrible. Yes they did harden and yes they were delicious, but they looked disgusting. So then I melted the chocolate chips, but this time I added a little more oil. NOT A GOOD THING. While it was thinner, I still had the same problem putting them in with the toothpick and when I took them out they just fell apart. They also hardened but looked horrible. WHAT AM I DOING WRONG? The dipping was so hard for me. Also, can I freeze the ones I had left over because I made so many because of the mess I made of the dipping? Oh Fran! Sounds like you had quite a time but great that you were prepared with all the different chocolates and were able to salvage the balls and serve them in the end!! It seems to melt much smoother and to just the right consistency for dipping. Also, if the toothpick doesn't work for you, try dipping with a dipping set such as the one I linked in an earlier post. Wilton has one and it doesn't leave a hole. Other than that, it's just a matter of PRACTICE, PRACTICE, PRACTICE!! lol. They're tricky little buggers but worth the effort once you master them because everyone will be so very appreciative!! I looking to make some cake pops using the Cadbury's white chocolate for the coating. Was wondering if the melting process of the white chocolate is similar to regular chocolate or if there are any adjustments to be maded, especially in the setting process. Thanks! lolz.. sorry for the typo *made. I had a problem with the chocolate melting process so I grabbed a box of confectioner's sugar and rolled the balls in the sugar and placed them on little cupcake papers, and everyone raved over them. Sooo made these yesterday...BUT forgot the freezing step. The cake balls seem good, but my husband says they are a bit mushy in texture? I think they taste great but wondering if me skipping the freezing step messed up something? Thanks! Making these today for my kids Valentine's day party - using white chocolate. Cannot wait to see how they turn out. TIP: instead of using my fingers to mix (yes it's messy!) I put the cake and icing in my kitchen aid mixer. Works great and NO mess! Has anyone ever tried adding a teaspoon of vegetable shortening to the chocolate? Many professionals do this to stop the chocolate from crystallizing. Regular baking chocolate can then be used, whether white or brown (white can be colored with professional icing coloring, such as Wilton's-NEVER use water-based food coloring! EVER!) Only heat until liquidy enough to dip, mixing the shortening into the chocolate gently. Like 10 to 20 seconds maximum. Also a few tablespoons of real rum or rum extract really brings out the flavor in the cake crumb/icing mixture for a real Christmas treat! Freeze crumb/icing mix balls overnight.You can use a melon baller or olive spoon scoop afterwards to make smaller balls. Reheat chocolate for 20 seconds and mix gently after 5 minutes each time you have rolled the balls. If red velvet sticks to your fingers while rolling keep a small pat of warm butter near you to rub your fingers on every time they get too sticky or in between balls. Just a few easy hints. Also you can sprinkle broken candy cane pieces on top of the wet chocolate to decorate or use silver balls (dragees) on top as an edible decoration. Also wet chocolate balls can be rolled in grated white chocolate flakes for white chocolate balls or grated dark chocolate flakes for brown chocolate balls. I just made these, and they are soooo good! Very sweet, but super delicious!